Join us for a tasting experience in the Karma Cave. Enjoy our signature bubbly or wine flights, in addition to hard cider, whiskey and bourbon flights. There is something for everyone. Stay and enjoy some cuisine from 18 Brix Restaurant. Our menu features ingredient-driven wine country cuisine using sustainably and organically grown local ingredients. 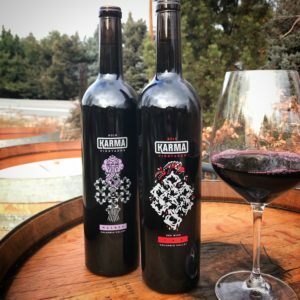 Karma Vineyards is open 11 to 3 today.